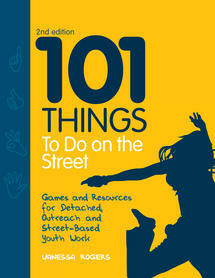 101 Things to Do on the Street is packed with creative and innovative ideas for street games and activities to help young people aged 11--19 explore personal, social and emotional issues. Specifically designed so that few resources or props are needed, the activities included are all practical, easy to follow, and above all, fun. As well as helping young people get to know each other, they explore issues such as gender stereotypes, offending behaviour, values, trust and street safety. They also aim to improve skills such as teamwork, communication, compromise and negotiation. From role-play and arts and crafts to discussion and quizzes, there are over 100 ideas to meet the needs of young people who choose to meet on the street, which can also be adapted for use elsewhere. This second edition includes information on what detached and outreach work is, tips and ideas on how to get started, staying safe guidelines, and over 30 revised or new activities. I like the accessibility of this book, which is clear and uses straightforward language. I also like the size of the print, which makes it clear for young people to access too, as they often like to take responsibility for activities and leading groups. It includes tips and potential pitfalls to be mindful of when planning and delivering this type of service. The author provokes useful thought and consideration of various points. I think this is a very good resource for any youth worker to have in their kit. Claire Todd, Senior Children's Cousellor, Psychological Service, Redcar & Cleveland Borough Council. Reviewed for Counelling Children and Young People, September 2012.